I am making something as a Christmas present, and will need to keep it secret, so my postings will only include snippets of the project. This is very fun to make. If you are on Ravelry, you can find more details there. 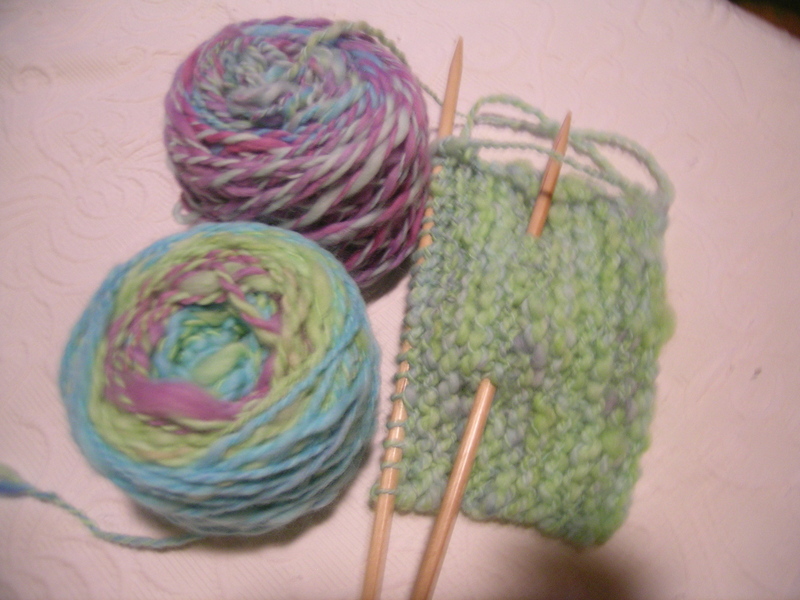 This is my first time using Knit Picks yarn, and I must say that I am pleasantly surprised by it. 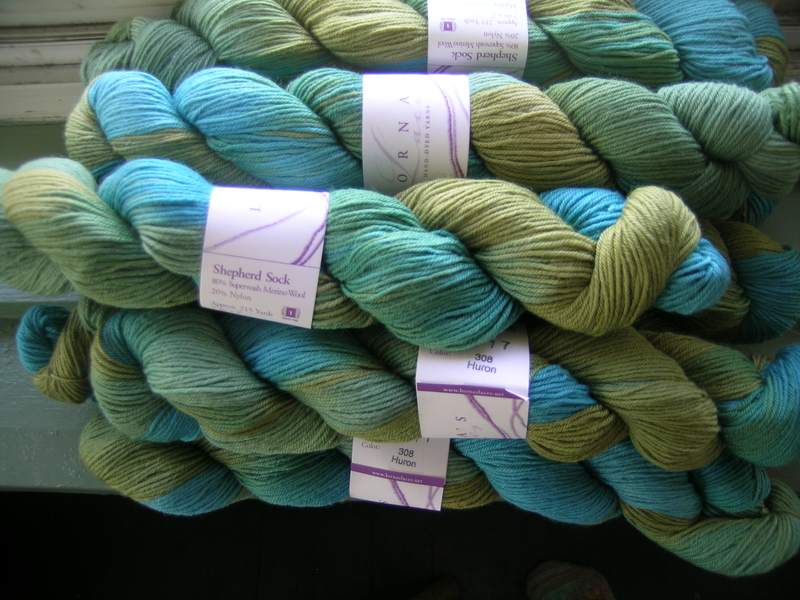 It is 75% superwash merino wool, 25% nylon. I am sure that the Merino is what makes it so soft. 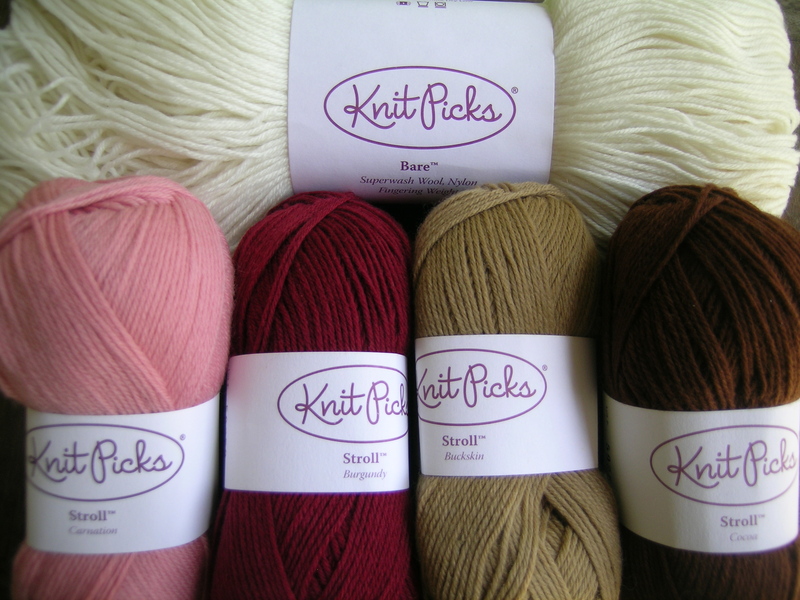 I have always avoided Knit Picks as I had thought that the yarns would be inferior, they only carry their own branded yarns. This would make wonderful mittens or socks. The colors are going to look pretty together I can’t wait to see what you make. This magazine arrived in my mail the other day. I knew that it could not be a gift from my family, as they would not know to order this. My first thought was that it was a trial that I received from taking my spinning class at the Wisconsin Sheep & Wool Festival. But then I looked closely at the mailing label, and it showed a year’s subscription. So, I tried out my limited internet detective abilities, and found on my account that it was actually a gift from my dear friend Manning. Thanks again Manning! I had one dog-eared earlier issue that I have been pouring through. This will be a fun challenge to learn everything. Next stop is to find some people to spin with who actually know how to spin, I don’t want to get myself into bad habits. I have been taking the Manning approach to learning thus far, and just watching YouTube videos. My knitting is slow but steady these days. I am guessing that I will get more done as the weather turns cooler, like it is tonight. I have been working on a pair of cable socks for a friend. My own design that I improvised as I knit. 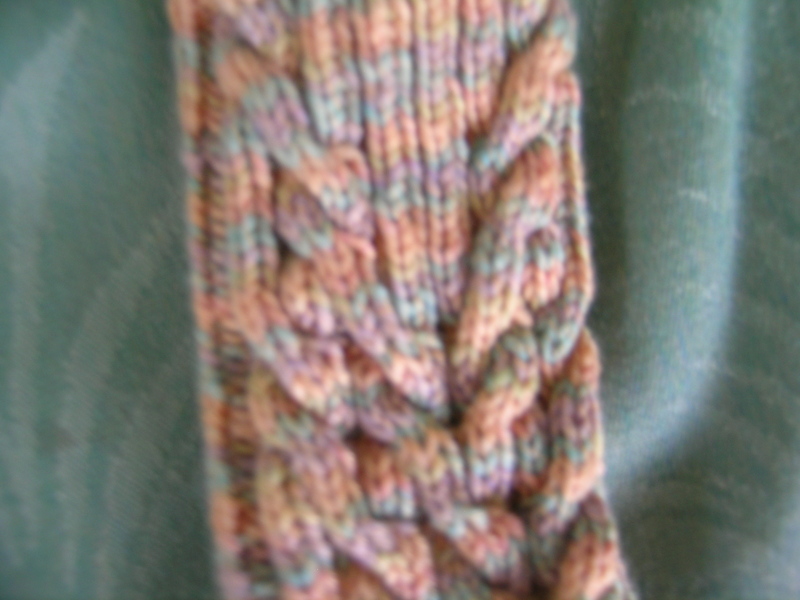 the cables travel across the front of the sock. I had started with just a simple cable down the sides, then decided I was bored with doing that. I am liking how they are turning out. The yarn is Panda Wool by Crystal Palace, it is very soft with bamboo in it, and has a nice lustrous sheen. I made this coat many years ago. It was designed by Joan Schrouder, and is called the “Barnstormer”. I was even able to track down the pattern in my knitting filing cabinet. I had taken a class with Beth Walker O’Brien at Have Ewe Any Wool in Elmhurst many years ago. I remember working on this in the spring of 2000 as I watched my son play baseball, and then we got into the car to drive to look at some poodle puppies for sale–and Lloyd chose us then. I saw her example of this coat, and she was offering a class. 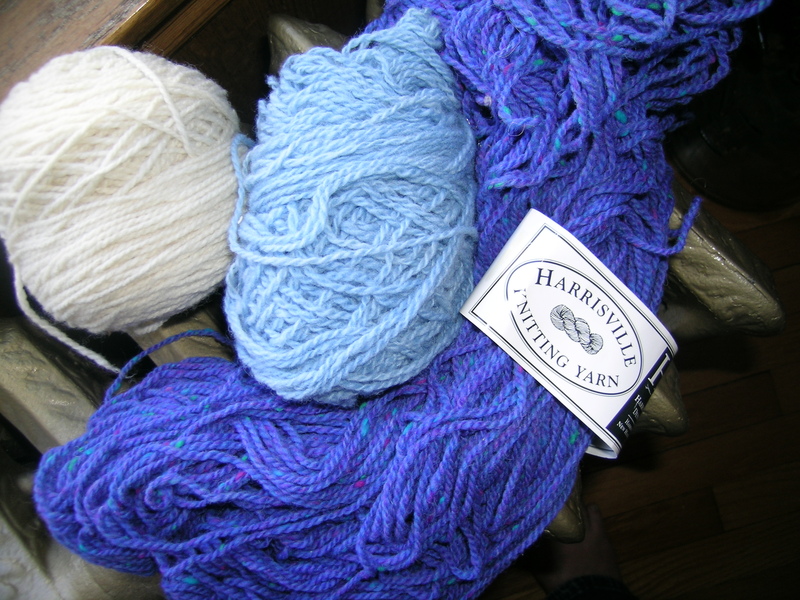 The original yarn specified was no longer available, so as a class we substituted Harrisville Highland Style. I worked hard on the colors, and time has proven it right, as I still love this jacket. It is a heavy garter stitch coat. 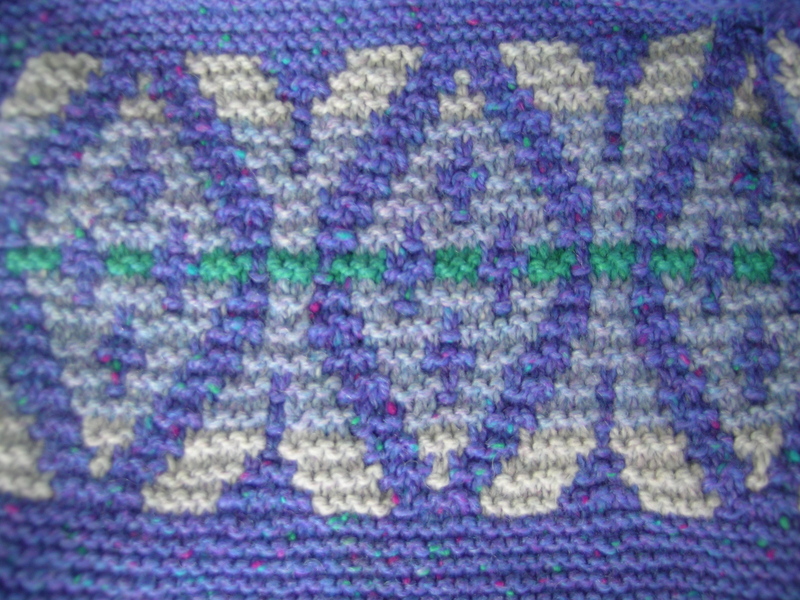 The decoration is garter stitch fair isle. This is about the only time that I have seen it done, and the result is stunning. 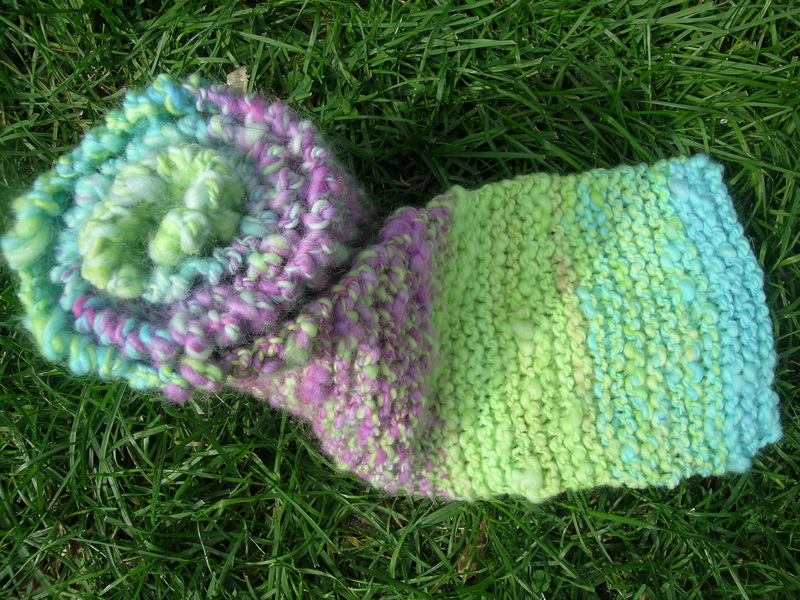 It has a knitted in pocket, a hood, and I-cord edging in an accent color. Whenever I wear this it elicits wonderful comments, even from yarn shop owners and at knitting events. I wore it last night to my knitting guild. They were talking about cleaning and preservation of knitted garments. I decided to photograph this today, and saw some food stains on the front (those snacks last night? ), and horrors, a small hole. 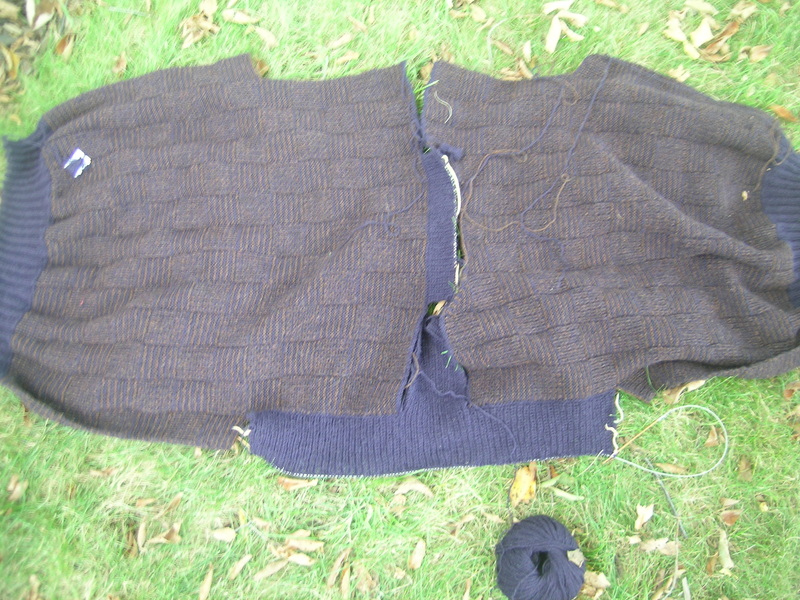 Luckily, I have a spare skein of the blue tweed, as I had planned long ago to shorten the arms. So, it is getting a well deserved bath right now, and I will dry and repair it. Do you know where I can get a copy of that pattern? You do beautiful work! I am envious. You done me proud, girl! I love your bright color choices! 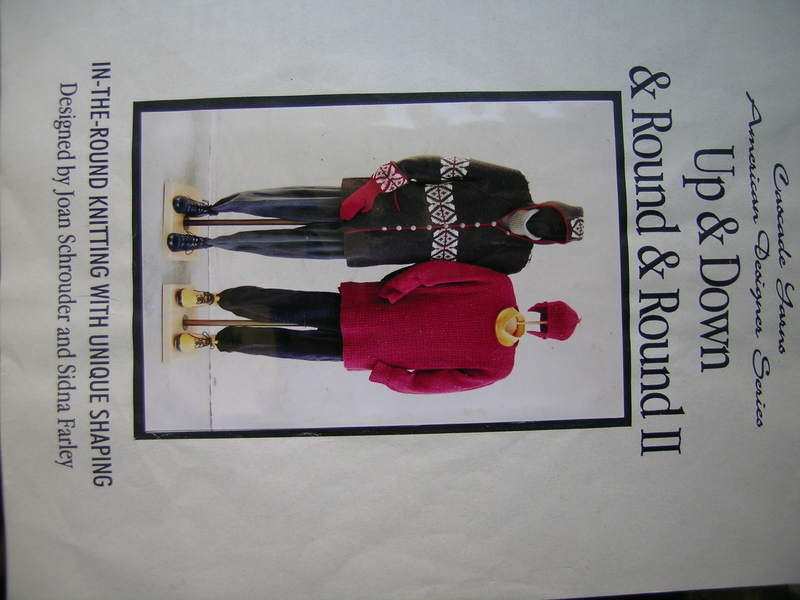 As for the pattern’s availability now – I sold the design to Cascade probably at least 15 years ago. Even if I were to re-secure the rights to publish it, I don’t have it on my computer any longer, so rewriting it would be a major job. Sorry about that. 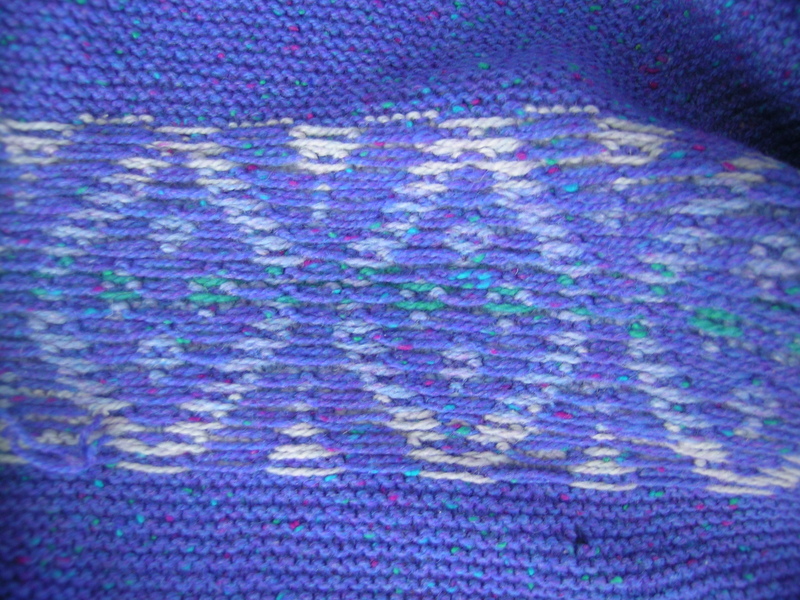 The patt was based on Elizabeth Zimmermann’s Hurry-Up Last Minute Sweater, sometimes called “Wishbone”, that’s in the December chapter of KNITTERS ALMANAC. The percentages are the same to get that shaping. 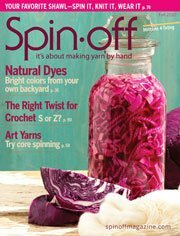 The difference is that it’s made in a finer wt yarn than EZ called for, KW-DK wt at 5 spi instead of super bulky. 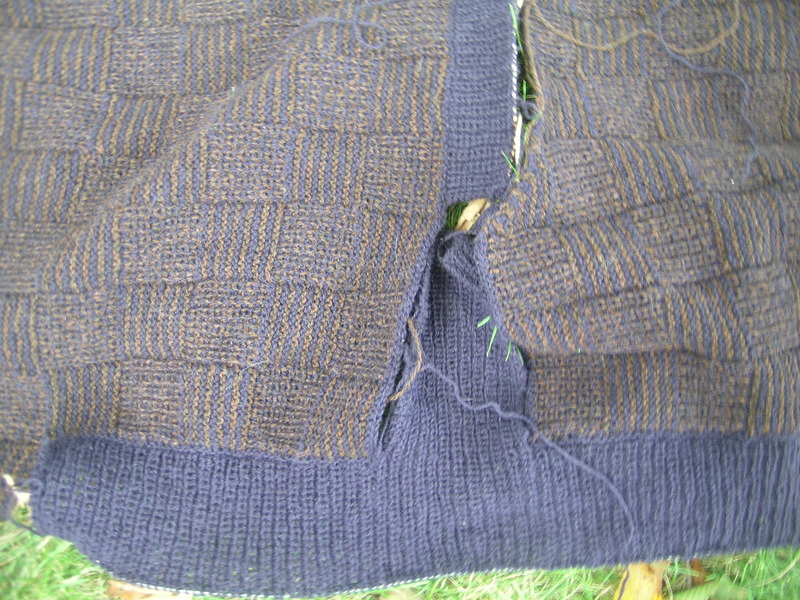 To make the yoke shaping work, you HAVE TO do it in garter or some other shorter row gauge yarn or else the armholes stretch down to your waist. I knit an earlier prototype without the FI band and it works and acts great, so that’s an option. 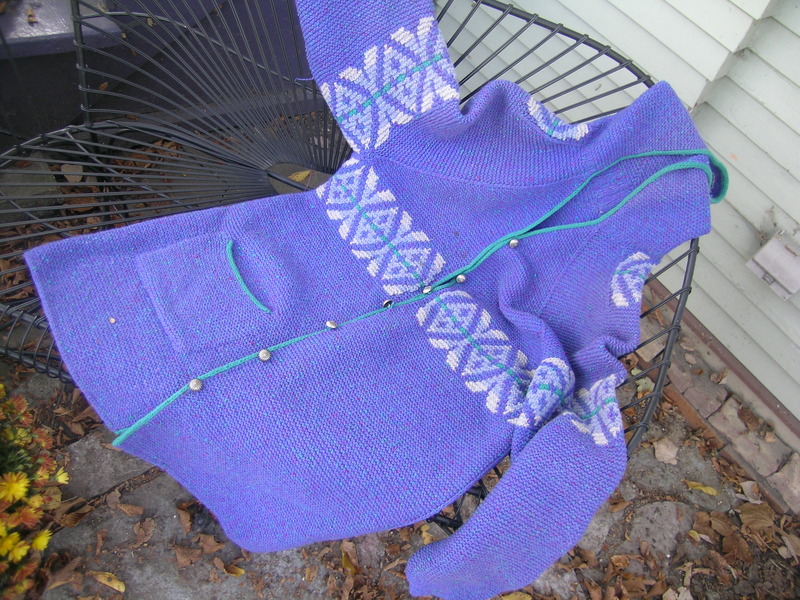 Thank you so much for posting pictures of both front and back of the fair isle design on your barnstormer coat. It is stunning! And thanks to “Schrouderknits” for explaining about the pattern. I have been sampling some “garter-jacquard” stitches and realized that long floats might be a problem unless you keep color changes to 3 sts or less. But I see that on your reverse side it doesn’t really matter. The floats work out so well. That was my big question about this technique, so thank you so much for clarifying that. I love your beautiful work. and thanks for sharing. I started these yesterday. We went to Wisconsin to see Ethan play frisbee, and I was working on another pair of socks. 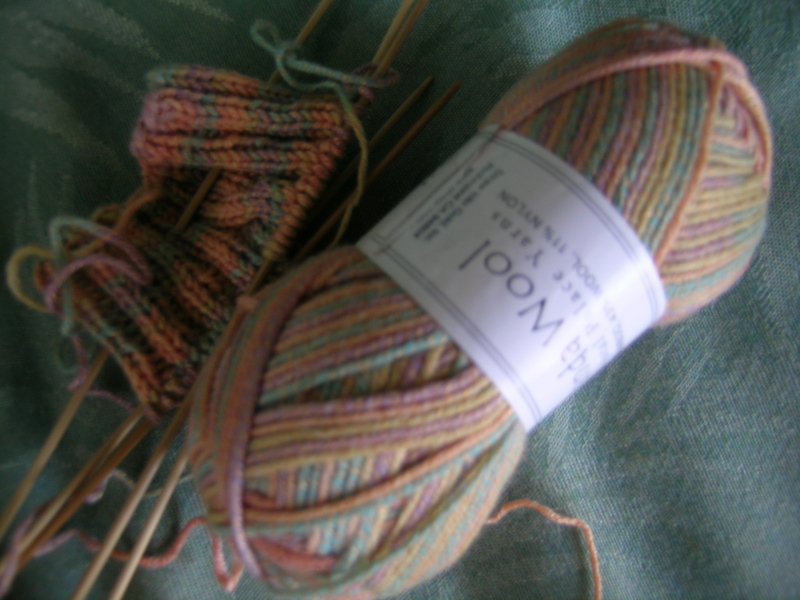 I had taken along a new book that I just got, Knit Socks! 17 Classic Patterns for Cozy Feet. I had been perusing this book the day prior, and saw the cute “Little Guys” sock pattern, and thought it would be fun to knit up. 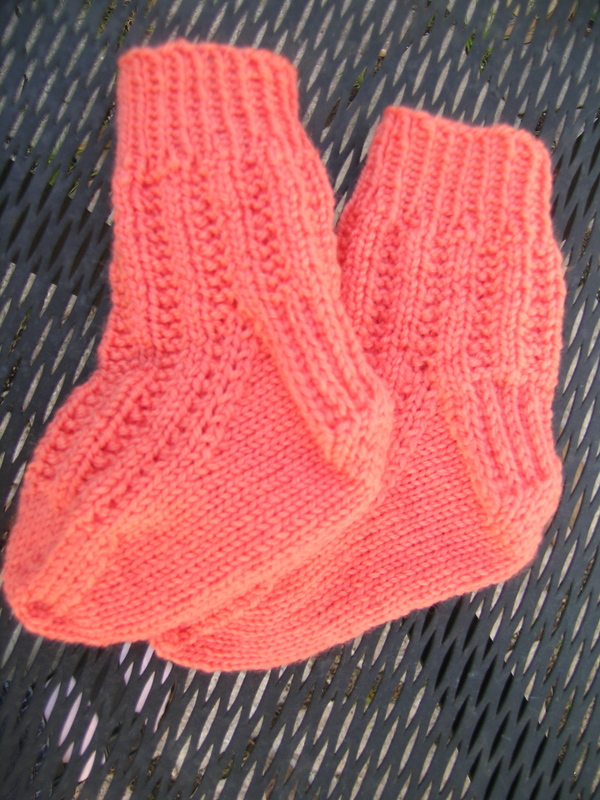 I used a beautiful tangerine colored Baby Ull by Dale of Norway, Size 1 needles. Very, Very Quick. There are some other patterns in this book that I would like to knit, notably the cover socks. This is a good book for beginning sock knitters, as every step is clearly spelled out in chart format. Myself, I could do without all of the beginning pages on the anatomy of a sock, and basic sock knitting techniques. Seriously, how many books do you need that cover this same information? Last spring I saw an inspiring lecture at my knitting guild by Susan Strawn, author of Knitting America, where she presented her doctoral thesis on Churro Sheep, and the craft culture of the Navajo Indians. I was reminded of it as I was cleaning out my emails. I had written to Susan after her lecture to say how much I enjoyed it, and she replied and directed me to this interview. The Churro Sheep were systematically wiped out by the US government first in 1865 by a massive slaughter prior to leading the Navajo on the long walk to Arizona, and again in the 1930’s by government imposed stock reductions. Or so they thought. The breed was considered extinct until Dr. Lyle McNeal and others started collecting and selectively breeding the sheep through the Utah State University. This is a great interview that aired on NPR last summer talking about the “Sheep is Life” festival that takes place every year in Arizona, and a bit of the history of the sheep. These sheep have been saved from extinction, and are no longer considered endangered. If you have been reading this blog, you will know that I just purchased a used spinning wheel and I am having great fun (not great success yet) spinning on it. 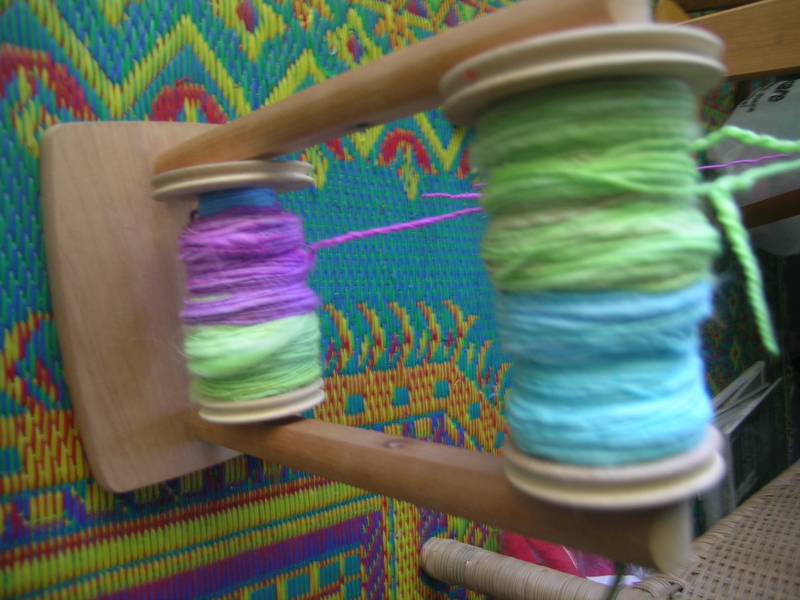 I had taken a drop spindle class a year ago, and never really got the hang of it. 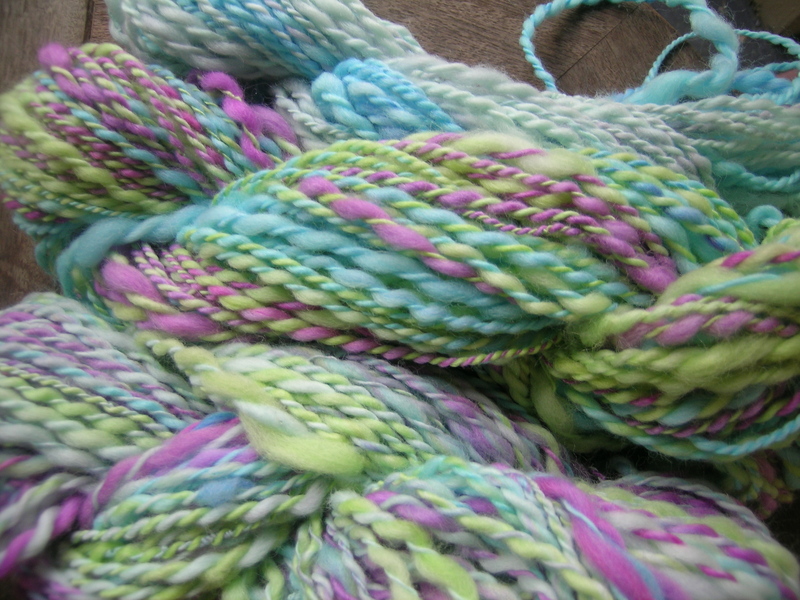 At the time of the class, I purchased 2 balls of Roving that I thought I would like to spin. They happened to be Navajo Churro. Now that I have a real spinning wheel, this wool will be coming into play soon. The Navajo-Churro sheep is considered a primitive breed, a direct descendant of the Churra sheep brought to Mexico in 1494 by Spanish explorers. It has a long hair outercoat, and a fine wool undercoat. Mainly used for weavings, the undercoat is good for outerwear. I am assuming that these rovings are the undercoat, as they feel very soft. I should be able to tell by the staple length. 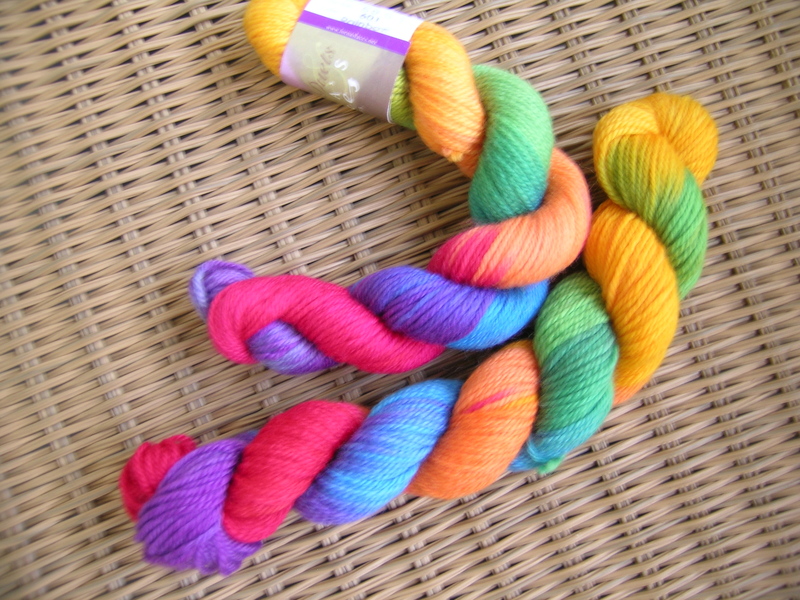 The wool comes in a wide range of natural colors. 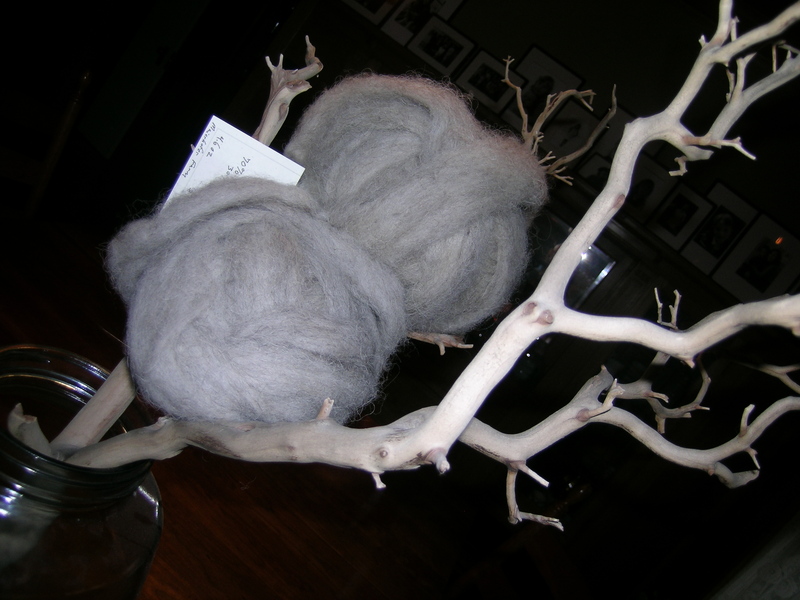 That looks like the roving I bought this year at the Midwest Fiber & Folk, from IL Green Pastures Fiber Coop. Though she said it was 30% alpaca for added softness. 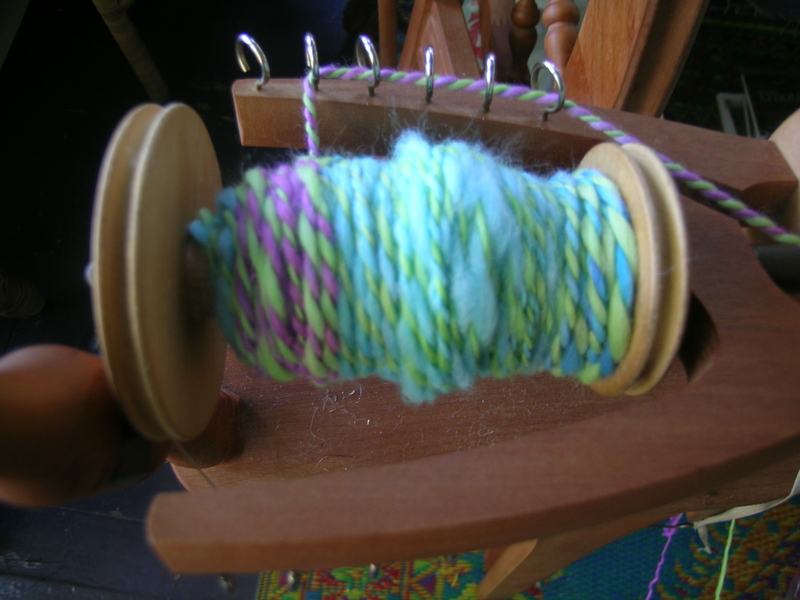 I also got a spindle and a free lesson there, and am enjoying learning it when I have time. 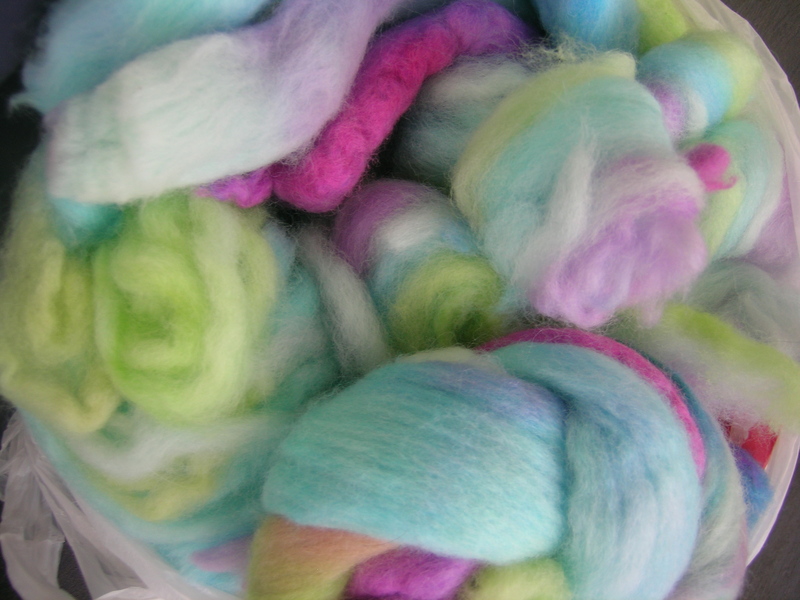 They also told me Navajo-Churro is great for beginner spinners, along with Romney, Corriedale, and Shetland. Thanks, I will check out the interview.Good luck with your wheel! 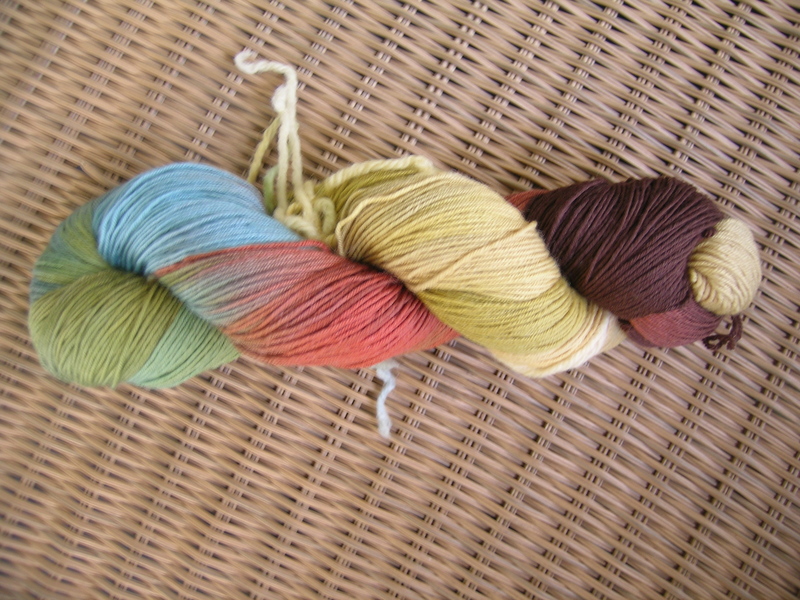 It is from the Illinois Green Pastures Collection, but all Navajo Churro wool, from the Maierhofer Farm. This is next on my list to spin up. Thanks for featuring Navajo-Churro sheep on your blog 🙂 Your roving is most likely a blend of both the inner and outer coats. Separating the two coats is a lot of work and is not necessary since it’s lovely to spin ‘as is’. Navajo-Churro is indeed classified as a ‘coarse’ wool but it should never be harsh to the hand. The Navajo-Churro Sheep Association breed standard describes the wool as ‘lustrous with a silky hand’. The N-CSA website: http://www.navajo-churrosheep.com has more information on the breed. Best wishes on the spinning. Keep at it – it will get easier as you go and it’s a lot of fun! Thanks, it is crimpy, but soft. I was not even aware of what I was purchasing at the time, just liked the look and feel. I had found that link, it is attached to Dr. Lyle McNeal’s name. It does have wonderful information there. Thanks for the info. She (Susan) also stopped by SnB on Monday! Did anyone (else) tell you? It will get better; lots of practice!! Looks pretty good to me! I love the purple and green combo! The sweater that is… I only wish that I could sit on the beach, especially in the gorgeous Fall weather that we have been having. Hanne Falkenberg Chess Men’s Pullover. 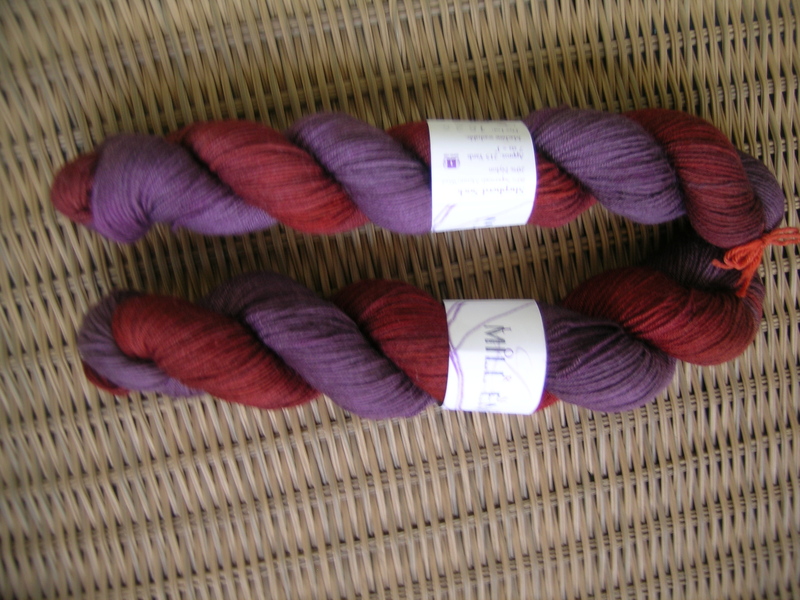 Colors: Aubergine and Coffee from the Hanne Kit.